Usually, the first line person experiencing the problem is the one assigned to communicate this to support. This is complicated by the fact that the first line support person getting the message generally lacks deep experience with the platform Explaining the issue in the terms that a support team can action immediately is a challenge for most of your staff. FBA has experience to gather relevant points of a problem and communicate issues clearly and in terms that SmartSimple support staff understand. Keeping track of trouble tickets and setting priority is a challenge. Even though SmartSimple provides comprehensive tracking of issues from beginning to end, if there is no prompting by the client, they have no choice but to close off tickets. It takes time to re-initiate and re-explain things. 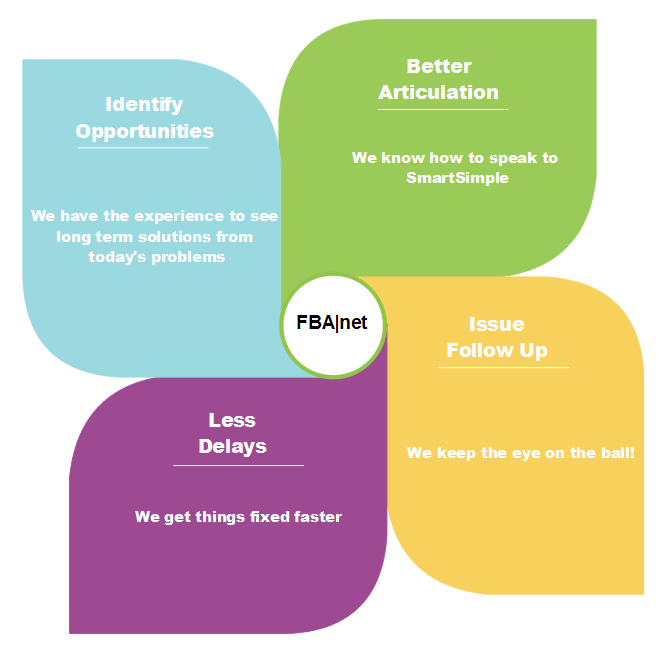 FBA knows how long certain types of issues should take – we give them a nudge where needed and follow the progress of a solution on your behalf. Issues with articulation create delays as emails escalate to phone calls and then to meetings. FBA will connect with your staff via video link to record the issue by actually seeing it first hand – then formalize a support request (if we don’t simply solve it for you right then and there). This gives either FBA or SmartSimple a clear picture of the issue in order to plan a resolution to fix or enhance. FBA does more than solve issues. We look at the context of the problem being reported and then we look for sustainable solutions beyond the immediate fix. We anticipate and head off problems before they even start! We provide first line support and in most cases fast turn around time. We help communicate complex support issues directly to SmartSimple on your behalf to manage a fast remedy and save you time. We have been working with SmartSimple in support, development and implementation for over 5 years. We serve the SmartSimple community in several vertical markets. We know SmartSimple platform and we know SmartSimple. OPEN A SUPPORT ACCOUNT WITH FBA – UNLEASH YOUR SMARTSIMPLE ADVANTAGE!